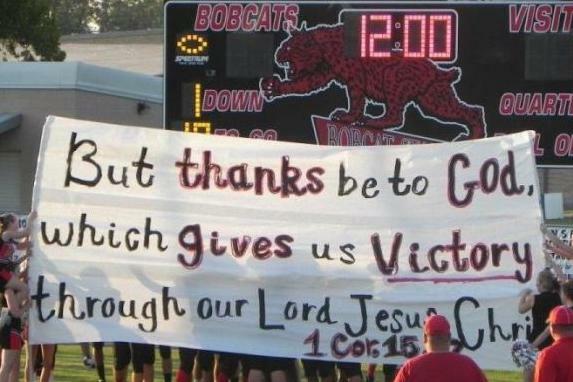 It seems that only some high school football teams in Texas are favored by god. KBTV noted that the Kountze Lions are undefeated so far this season. The cheerleaders seem to think that the signs inspired the players to victory. For once, the school administrators did the right thing and banned the practice. However, a local judge has issued a temporary restraining order allowing the cheerleaders to continue for 14 days. It's a bit of an interesting legal question at the intersection of student initiated prayer versus official prayer but the cheerleaders are on the field as representatives of the school. If they wanted to hold up the banners in the stands as spectators, that might well be a different thing. But the school, it seems to me, can't allow them on the field as participants and also allow them to proselytize. But two things struck me. First of all, aren't those kids from other Texas high schools also praying? Maybe its just that they're not as big and as fast as the present team from Kountze. And, if next year the Kountze team starts losing, will they blame it on the town's lack of faith or, worse, on God? "They weren't getting very fired up by 'Kill the Cougars,' so if we say 'you have power, God gives you the strength,' I mean, that makes me want to do good," Ashton Jennings, a Kountze cheerleader, told the TV station. Somewhere there is a serious disconnect in these kids. 1) This is the kind of thing that forces me to reread Lincoln's Second Inaugural to cleanse my thoughts. 2) Having graduated a Texas high school, I am not one bit surprised that the cheerleaders are holding up bible verses. But now I'm wondering about the drill team and why they aren't holding up scripture verses too -- are they a pack of godless atheists?! I am also wondering if the drill team is called the "Lionettes" but I already googled Lincoln's Second Inaugural and this is a Friday. Isn't it an offense to fix the result of a football match, whether done by humans or a deity, in which case the cheerleaders could be guilty of conspiring to commit an offense and of aiding and abetting the commission of said offense? Except no one thinks it really works, not even these cheerleaders. Push come to shove, they don't blame god when they lose and while they may pay lip service to god when they win, they still throw accolades (and many other favors, especially by cheerleaders) at the players, who everyone knows are the ones who makes the difference. It really is just is a social glue "strategy" (if we can grace it with that term) to express the majority communities values. Dang, Ian H. Spedding. Now I'm wondering if I am guilty of conspiring to fix an election by invoking the aid of my deity. It just made me think of the losing team suing on the grounds that the winners had fixed the game. That reminded me of that very entertaining Billy Connolly movie The Man Who Sued God which led me to look up real cases of people who'd attempted to sue God in the courts - which wasn't very encouraging. People have attempted to sue God? Well, it's not like it's not understandable sometimes, but still -- ! Thank you for the best laugh I've had all week. I'll have to see that movie. Seriously. Although I'm guessing that the lawyers and judges involved secretly find them a sort of light relief from all the boring or really bad stuff they mostly have to deal with. I think you'll like the movie. The trailer's on YouTube. "Push come to shove, they don't blame god when they lose ..."
From this and then move on to another on section so the fight-or-flight stress response is a conserved psychophysiologicalresponse many stimuli can rapidly trigger this response like we saw the beginning they could be clearly dangerous predatory stimuli where they could also be excitatory stimuli or voluntary stimuli like agreeing to give a talk to people or running on a treadmill for what happened okay so many stimuli can trigger this response often events that trigger a stress response first so the précis the predator coming get stressed it starts to run it gets dressed even more okay so this the stress .